With the arrival of autumn in the Willamette Valley, you've probably noticed pumpkins for sale at grocery stores and local farms. You might also have them growing in your garden. Pumpkins are one of the most recognized seasonal indicators. When they ripen, you know that Halloween, Thanksgiving, and cool weather are on the way. Pumpkins also remind me of a Rafn family tradition dating back three decades--- Pumpkin Cookies! Family recipes are an important part of the holiday experience. It gives children and adults alike an opportunity to engage and create something memorable. It is this custom that preserves family connections, and keeps us in touch with fond recollections of years past. Of course, every family is different. Visit the homes of friends and neighbors during the holidays, and you're likely to find baked goods derived from their respective ancestries. My family enjoys a few holiday treats that have been selected for their taste and relevance to Danish or American culture. At the top of the list are homemade eggnog, Danish julekage, and Grandma's unusual, but tasty, pumpkin cookies. 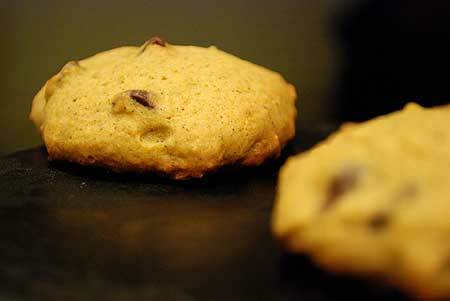 My grandmother, Louise Rafn, was the first in my family to make pumpkin cookies. She originally found the recipe in a Church of Latter Day Saints Relief Society magazine. She liked the recipe so much, that she submitted it to the Salem 4th Ward Relief Society cookbook in 1979. It has been a popular treat in my household, and others in the Salem area Mormon community, ever since. The recipe features two ingredients that are not often used in conjunction--- pumpkin and chocolate. While the two are not very good together as a couple, they relate just fine as long as you invite mutual friends to the party. For example, pumpkins are often paired with dairy products and warming spices, like cloves and ginger. Likewise, chocolate and dairy make wonderful mates. In addition, chocolate also combines deliciously with spices like cinnamon, allspice, ginger, and cardamom. These spices highlight chocolate's depth of flavor, and its bitter-sweet, aromatic qualities. The formula listed below produces a cookie that is subtly sweet, soft, and somewhat bread-like. Most of the moisture comes from the pumpkin puree. So be careful not to over-mix the dough. Preheat your oven to 375 degrees. Stir the butter to soften. Gradually add sugar and cream together until light and fluffy. Add egg and vanilla, and mix well. Sift flour, baking powder, baking soda, spices, and salt. Add dry ingredients to creamed mixture alternately with pumpkin. Beat after each addition until smooth. Fold in raisins and nuts (optional), and chocolate chips. Drop by rounded tablespoons on two greased cookie sheets. Bake each batch at 375 degrees for 10 to 12 minutes. Cool on a wire rack. Enjoy these cookies with a mug of eggnog! Note: These cookies freeze very well.